White Powder for Christmas? No, Thanks! The envelopes containing white powder started arriving at U.S. embassies on December 15, 2008. As of today, 19 embassies have reportedly received envelopes with the white powder: Berlin, Bern, Brussels, Bucharest, Copenhagen, Dublin, Luxembourg, Madrid, Oslo, Paris, Prague, Reykjavik, Riga, Rome, Stockholm, Tallinn, The Hague, Tokyo and yesterday, Nicosia. All European posts except one (Tokyo); all EU-member states except two (Bern, Switzerland and Reykjavik, Iceland). Looks like somebody has a nasty Christmas humor; somebody who deserves all 22 criminal statutes gift-wrapped and delivered, preferably with a substantial fine and 20 years in jail. Is there any rhyme or reason why these posts were selected? One of the journalists during the daily press brief asked if perhaps somebody just went through the alphabetic list of our European posts. You can see the list here, it’s not — or he/she/they/it would have started with Ankara (by capital), or Adana (by post) or Albania (by country). All but three of the recipients were countries in the European Union. If the EU countries were specifically targeted, it does not explain the inclusion of two non-EU states (unless the perpetrator/s were too lazy to look up the composition of the EU) and it also makes me wonder if 12 more letters are in the postal pipelines (12 missions in EU countries have not reported receipt of similar letters). Since Monday, December 8, letters containing a note and suspicious white powder have been received by the offices of more than 40 governors across the country. Additional letters have been received at several U.S. Embassies overseas, said Robert E. Casey, Jr., Special Agent in Charge, Dallas FBI. The white powder in each of these letters has been field screened and the tests have met with negative results. The powder has been forwarded to local laboratories and testing to date has been negative for biological agents. The FBI has contacted the governors’ offices and the State Department to be on the lookout for additional letters. Today, Mr. Casey announced the release of additional information regarding these mailings, to solicit the public’s help to identify the person or persons responsible for these crimes. 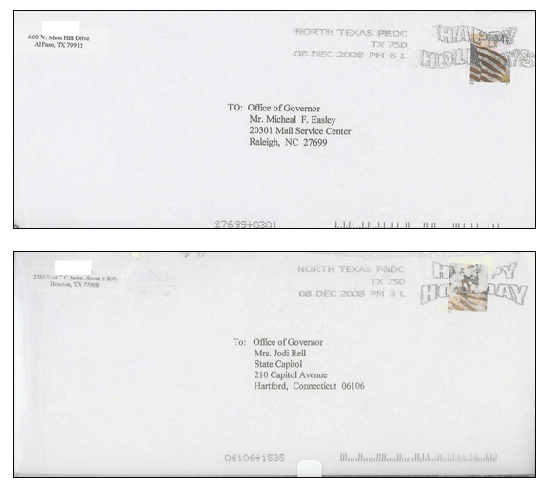 Photographs of envelopes sent to governors’ offices are below. Although the photographs are of the envelopes sent to the governors of North Carolina and Connecticut, they are similar in content to all letters sent to the governors’ offices and embassies overseas. #1. The postmarks reflect mailing on December 4, December 8, or December 11, 2008. #2.The postmark is either “Dallas, Texas” or “North Texas”. The “North Texas” postmark reflects the envelope was processed through the mail facility in Coppell, Texas, a suburb of Dallas. #3.The return addresses used have been one of four addresses for FBI offices in Dallas, San Antonio, Houston, and El Paso, Texas. Names have been redacted from these addresses; the FBI is not disclosing the names at this time. #4.There is a note within the envelope. The content of that note has been the same in each mailing. Although the content of the note is not being disclosed at this time, the meaning of the message is not clear. Although the substance contained in the mailings is not harmful, the threatening mailings not only constitute a federal crime, but cause alarm to victims and victim institutions and expend costly resources of police, fire, and other emergency responders and state, local, and federal laboratories. The FBI and United States Postal Inspection Service intend to vigorously investigate these crimes and arrest the person or persons responsible. The Postal Inspection Service is offering a reward of up to $100,000 for information leading to the arrest and conviction of the person or persons responsible for these mailings. Anyone with information on who may be sending these letters is requested to contact the FBI at 1-800-CALL FBI (1-800-225-5324), the Postal Inspection Service at 877-876-2455, or local law enforcement. If you receive a letter, please notify the FBI and your local authorities. Information on how to handle a suspicious package can be found on www.fbi.gov. Update 12/25: Our Embassy in South Korea also received white powder in the mail according to AP a couple of hours ago. That makes 20 posts now, with two in Asia. Update: 12/26: Our U.S. Embassy in Madrid was in the news for receipt of white powder in the mail; and today, the U.S. Embassy in Turkmenistan for receipt of a similar item on the 23rd. The NYT is reporting today that HRC is recruiting Jacob J. Lew, the budget director under President Bill Clinton, as one of two deputies, according to people close to the Obama transition team (Clinton Moves to Widen Role of State Dept.). Mr. Lew’s focus, they said, will be on increasing the share of financing that goes to the diplomatic corps. He and James B. Steinberg, a deputy national security adviser in the Clinton administration, are to be Mrs. Clinton’s chief lieutenants. Very promising. Sounds good to you? Read more on Jacob Lew and NYT’s brief bio here; also James Steinberg. How Could You, Zain Verjee? As part of the legacy interview series which started in early December with Fox News, the Secretary sat down with Zain Verjee of CNN on December 17 in Washington, D.C. Below is part of that interview. You can read the entire text here. QUESTION: The worst breach of national security in the history of the United States came under your watch. QUESTION: Did you ever consider resigning? SECRETARY RICE: I do take responsibility. But this was a systemic failure. The United States of America had experienced terrorist attacks in 1993, in 1998 in our embassies abroad, in 2000 against the Cole, and then finally in September of 2001. But the fact of the matter is that we had not thought of this. We, the administrations before us, had not thought of this as the kind of war against the terrorists that we were going to have to wage. And by the way, some of the things that people have been most critical of have given us, really, the capacity to respond. The ability to surveil terrorists through the Terrorist Surveillance Act so that there isn’t a gap between what terrorists are saying when they are abroad and what terrorists are saying when they’re in the United States. These are tools that simply didn’t exist prior to September 11th. QUESTION: Do you regret your role in the Iraq war? SECRETARY RICE: I absolutely am so proud that we liberated Iraq. QUESTION: But it still (inaudible) into total chaos and (inaudible). QUESTION: Many Iraqis don’t agree with you. SECRETARY RICE: — that is stable. Well, you only have to look at the case. You only have to look at the declining violence. Fragile, yes, but declining. SECRETARY RICE: And you have to ask yourself, would you really rather have a Middle East, which you know has to be different than it’s been for these many years, would you really rather have an Iraq with Saddam Hussein at its center? That’s the other choice, and I don’t think that’s a good choice for the world. QUESTION: What needs to happen for the world to say that the Iraq invasion was justified, positive, and right? QUESTION: And the Iraqis are showing through — throwing shoes at the President? SECRETARY RICE: Well, an Iraqi is throwing a shoe at the President. Let’s remember again, Zain, if there was anything that was unfortunate about that incident, it was that it was what got reported. Because as a serious scholar of international politics, do I really think that 30 years from now or 20 years from now or 10 years from now, that will be – a shoe being thrown at the President is somehow going to be what was important about Iraq? Of course not. And that’s why when people report on today’s headlines instead of on history’s judgment, they make a mistake. QUESTION: What about you? What have people got wrong about you? SECRETARY RICE: Oh, I don’t know and I really don’t care.